One of my favorite songs of the past decade is "The Best Ever Death Metal Band Out of Denton" by The Mountain Goats. This cartoon is nowhere near as good as that song. But then, not much is. Someday I hope to draw a comic that approaches the pure manic energy and disarming wit of a John Darnielle song lyric. Someday! 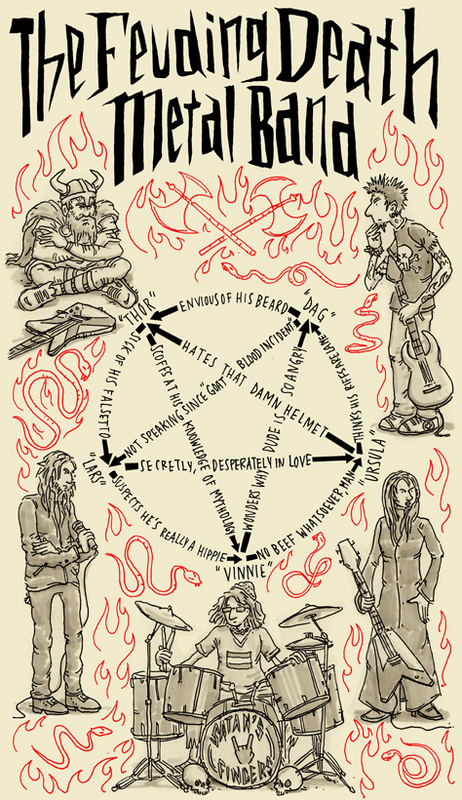 the characters and everything was really good, and i liked the concept of adding the humourous lines to the pentagram. Yes! The Mountain Goats are my favorite band. "Hail Satan!" I saw "Satan's Fingers", thought "that must be a Mountain Goats-fan" and then read the description. You, good sir, have excellent taste in music and are one hell of an illustrator. Love this!